You’ve been working hard all year. Yes we know about how often you play Minecraft on your work computer, but don’t worry, we won’t tell your boss. Take a break from building that 3,000 block statue of Yoshi and plan the weekend that rewards the toils of U.S. workers. You can hit up one or a dozen clubs, enjoy some delicious eats or just drink until you can’t remember your login password for your work computer. It’s “LoverBoy1983,” BTW. You should probably change that. Then you should head out this weekend for some of the best Labor Day events in Las Vegas — and a couple super random ones at the end. Trey Songz at Drai’s. 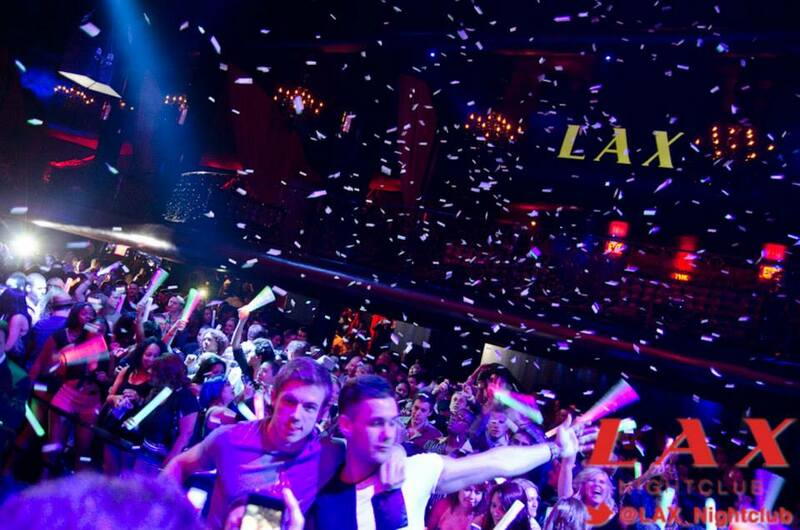 Photo courtesy of Drai’s Nightclub. Live music is one of those things you might not have time to enjoy in your nine to five life—or more like midnight to eight life if you’re a Vegas local. 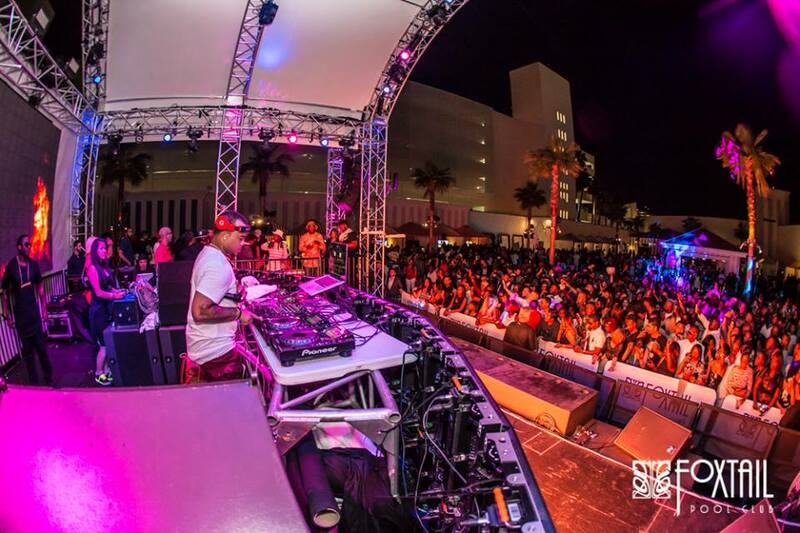 While you’ve got this break from the grind, head to Drai’s rooftop nightclub and check out Trey Songz performing live. 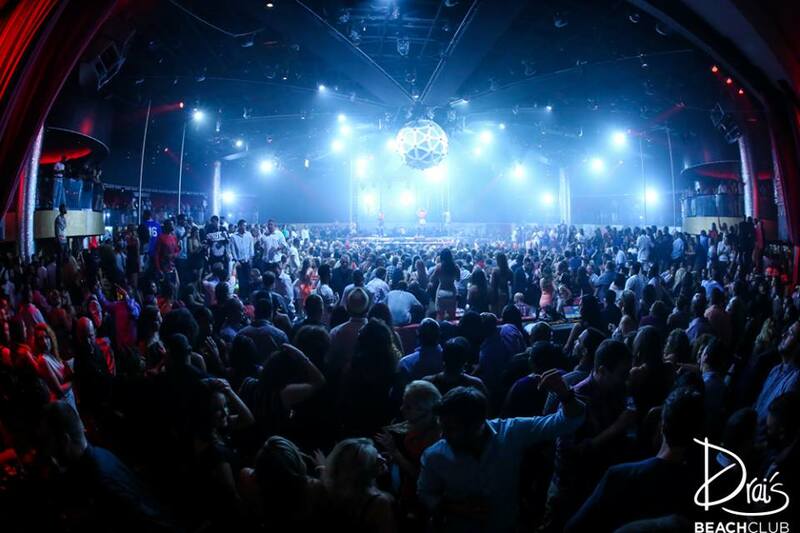 Drai’s is one of those venues that’s known from the beginning how important live music is to any club, and they’ve never failed to bring in some of the best entertainers. You’ll get the DJ experience at Drai’s too, but this is the party for people who want a little more live action on their long weekend. Travis Barker showing why the drummer deserves some. 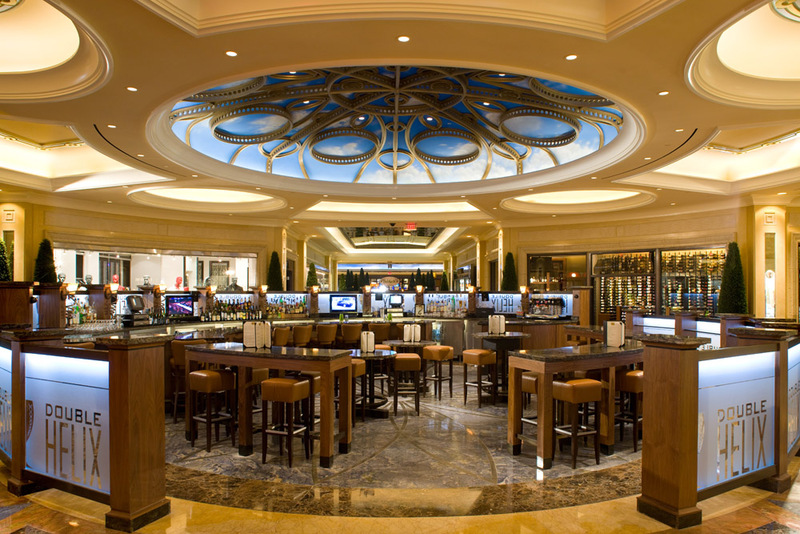 Photo courtesy of Hyde Bellagio. 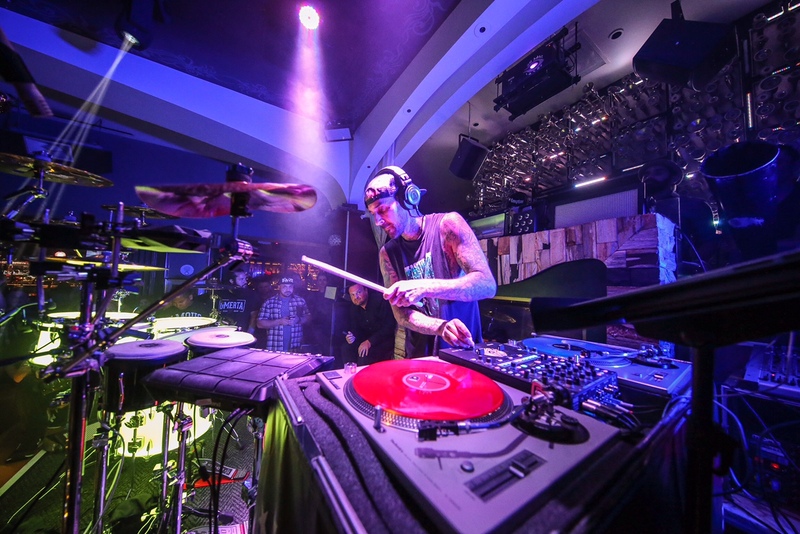 We’ve talked about Travis Barker’s “Give the Drummer Some” residency at Hyde Bellagio before. It’s an incredible mix of performance and presentation that you probably haven’t seen done so perfectly before. Barker spins and hits like no one else and, combined with the light show, that all creates a night of sensory satisfaction that we can’t wait to experience again. If you weren’t able to make it to the previous performance, or you’ll only be in town for Labor Day weekend, Barker’s residency at Hyde is one party you really shouldn’t miss. Any awesome night at LAX. Photo courtesy of LAX Las Vegas. UFC is pretty popular in Las Vegas, and with fans around the world. And the promoters are pretty great at setting up events that will draw in crowds and take advantage of times when lots of people will be here. If you’re here for UFC 191, or it just happened to work out that way, enjoy the fight then head over to LAX for the after party. UFC fighters will be in attendance. We don’t know if they’ll sign autographs, but you can always try and ask nicely. He is far more snoop than you. Photo courtesy of Tao Nightclub. You know Snoop. If you don’t know Snoop it’s possible that you knew Snoop at one time and just forgot. We’re pretty sure that’s what was up with the whole Snoop Lion phase. But now you can snoop it up all over again at the Snoopadelic Cabaret. 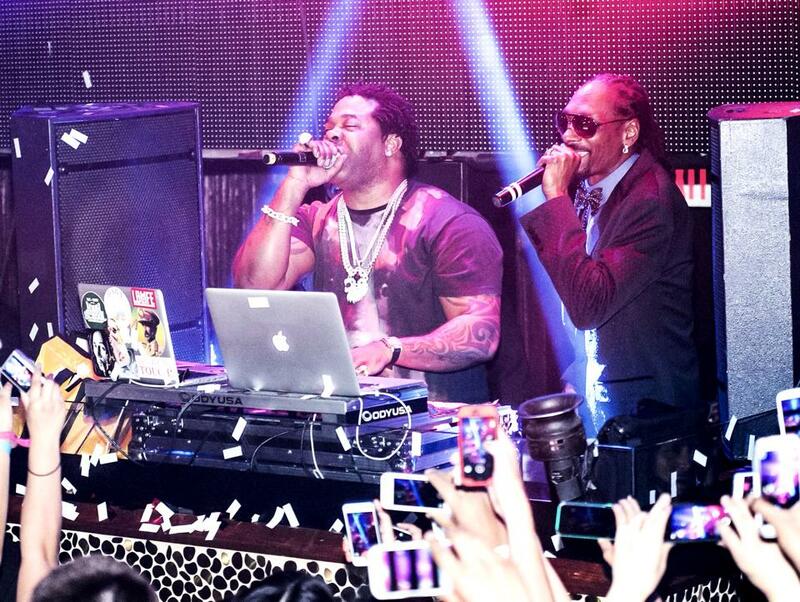 As DJ Snoopadelic, Snoop Dogg has been bumping Tao Nightclub during past performances. This Labor Day, he’s back and snoopier than ever—that does not mean he’ll do the Snoopy dance. But you can always try and ask nicely. Feel pretty at Tao Beach. Photo courtesy of Tao Beach. Comedian Kevin Hart will be performing two comedy shows at the Chelsea at the Cosmopolitan of Las Vegas for his Hartbeat Weekend. He’ll also be at Marquee Nightclub—scroll down for that info. But in between it all he’ll be hitting up Tao Beach to host a hell of a party also presented by Miller Lite. Tao is one of those intimate pool clubs where getting close is a possibility, and bringing in Kevin Hart means the place will be pack with hotties who want to laugh in the sun and probably have a Miller Lite or two. Lil Wayne at Foxtail Pool Club, obviously at night. Photo courtesy of Foxtail Pool Club. We always love a good party at Foxtail, but unfortunately they always seem to end just when we’re getting things going. This LDW, none of us will have that problem. Foxtail is going all day long with a 12-hour event sure to sate even the strongest of partiers. For entertainment, they’ll have Lil Wayne and Fetty Wap who was just named the #1 Artist to Watch at the VMAs. Come early and stay the whole day, or show up when you’re ready and be the last one standing at this amazing day-long blast at SLS. We hope they drop more balloons. Photo courtesy of Hakkasan. It’s the club in Las Vegas that’s still standing tall on top of MGM Grand. And it’s the place with the big names in EDM that most people even outside the scene are familiar with. Hakkasan is that club that you go to when you want to say you’ve been there and you want to see someone you know won’t disappoint. This LDW they’re bringing it all with the DJs you know and love. 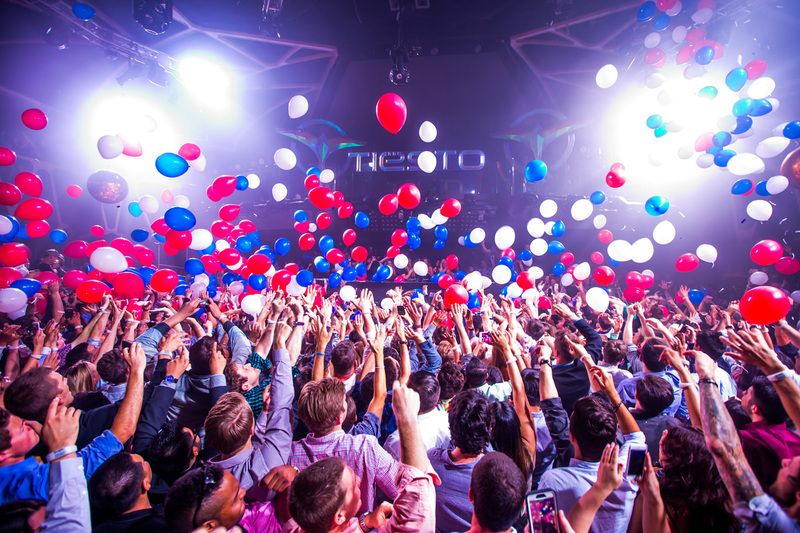 If you want a pure club experience while you’re in Vegas, this is the place to go. 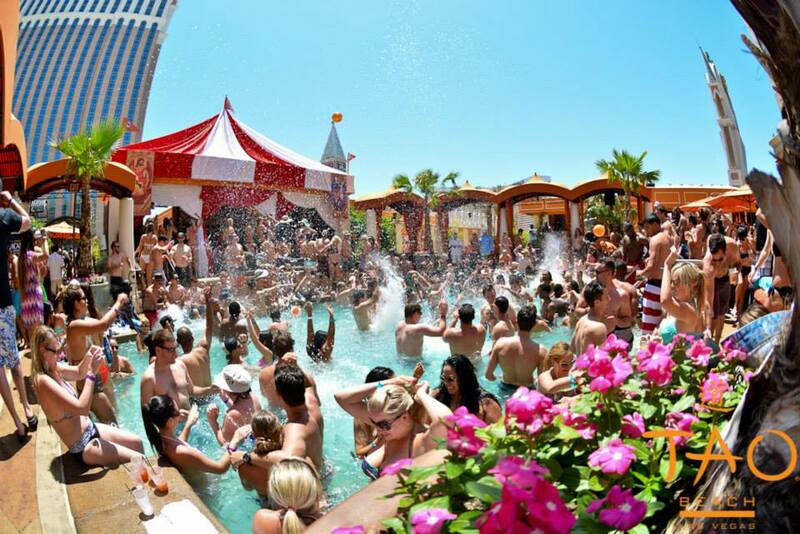 The same set of DJs will be spinning at Wet Republic the day after each of their shows at Hakkasan. So if you still want to see them but couldn’t get in at night, or you just prefer the day for some strange reason, check out the sights and sounds at one of the hottest pool clubs around. Ling Ling Room. Photo courtesy of Hakkasan. 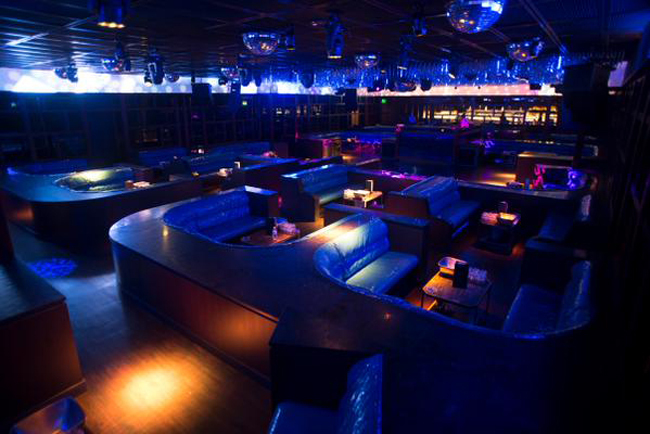 Hakkasan also includes the lovely Ling Ling Room where a more intimate setting awaits. On Friday they’ll be bringing in the legendary DJ Jazzy Jeff to spin the night away. They’ll also have performances throughout the weekend. If you want the club atmosphere but a little more time to breath and sit down, check out the Ling Ling Room. 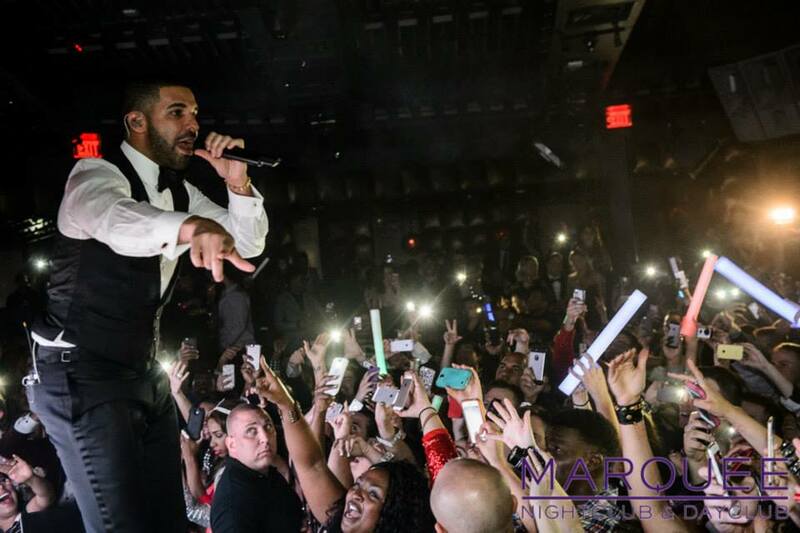 Drake at Marquee NYE 2015. Photo courtesy of Marquee Nightclub. We promised you more Kevin Hart. Because who could ever get enough Kevin Hart? For the official after party of his Hartbeat Weekend, not only will Kevin Hart be gracing Marquee at the Cosmpolitan, he’ll be bringing along Drake just for the occasion. When you’re making plans this weekend , you’ll have a lot of choices. But you just have to ask yourself, which parties give me both Kevin Hart and Drake? If you answered that one party you got invited to under the 95 overpass, then you’ve been lied to and you should not go to that. The correct answer is Marquee and it’s going to be amazing. Imagine at Omnia. Photo courtesy of Omnia Las Vegas. 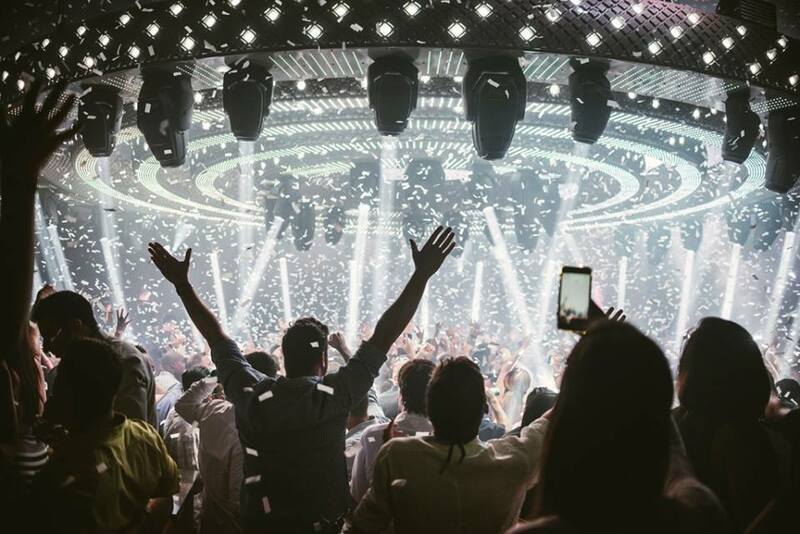 Imagine at Omnia has rocked our Sunday nights throughout the summer. It’s been a night of beautiful décor and outstanding music coming together to create experiences that we definitely won’t forget. It’s one of those theme nights that we wish would go on forever, and we don’t just mean keep recurring. We mean we wish we could live there all the time. This LDW we’re sure they’ve got something special planned, so hit up Omnia and see Armin van Buuren at the deck. We don’t know what to expect, but that’s part of the fun. Double Helix. Photo courtesy of Double Helix Bar. Ok, maybe the clubs aren’t your thing. Maybe you’re in town for a more relaxing Labor Day and you keep trying to explain to those damn Millenials that 120 decibels of dubstep isn’t your idea of a good time. Whatevs. You can totally still have fun at a low-key spot. If you’d rather just have a quiet drink while you do some shopping, you can get half off any rum on the list at Double Helix. That should make for quite the tasty weekend. 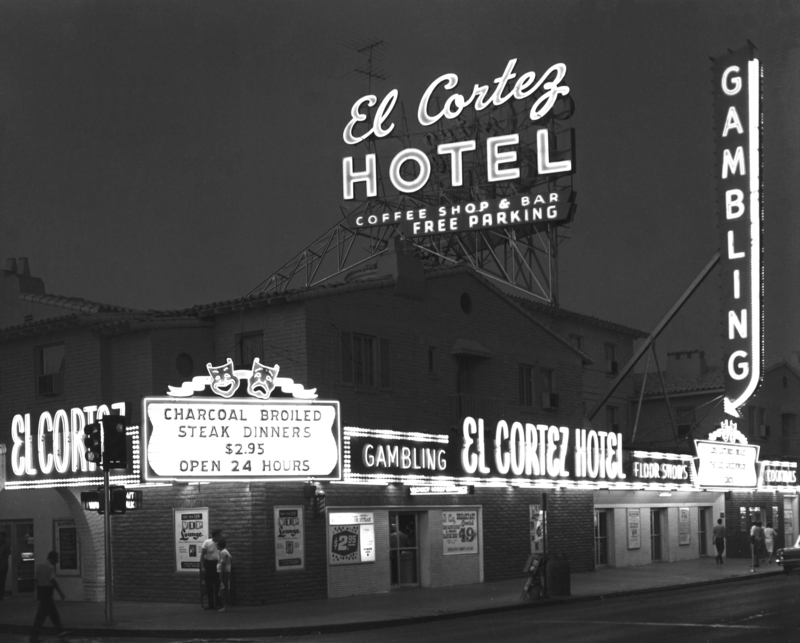 Exterior of the El Cortez in downtown Las Vegas 07/11/66. It looks more colorful now. Photo courtesy of El Cortez. When: Monday, Sept. 7 from noon to 6 p.m.
And maybe you’re not into drinking at all, or you just know you’re going to need some food in your stomach before you move to the next party. As a bonus to this already party-filled piece, we’re letting you know that you can get free White Castle burger at the El Cortez just for playing any game in the casino. Sit down, start playing and get served. We have no idea why, or why we’re including it, but when it comes to getting free White Castle we usually say, why not? For more Labor Day Weekend ideas, hit up our LDW page.